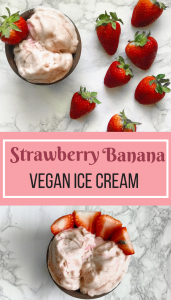 Strawberry Banana Vegan Ice Cream: Quick and Easy Recipe! Quick and Easy Vegan Desert! Cut up Bananas and place in freezer overnight. Place all ingredients in a blender, blend until mixed together. Scoop out and serve, or place in the freezer and save for later! ***If you do not have Agave Syrup, you can use honey or maple syrup as a substitution.